Semifinal #1, UND vs. SCSU, 4:08 p.m.
Third place game, 3:38 p.m. This is the real March Madness. Four teams have ascended upon the Target Center in Minneapolis for this weekend’s National Collegiate Hockey Conference Frozen Faceoff tournament and all will be looking to grab some hardware on the way to next weekend’s NCAA tournament. 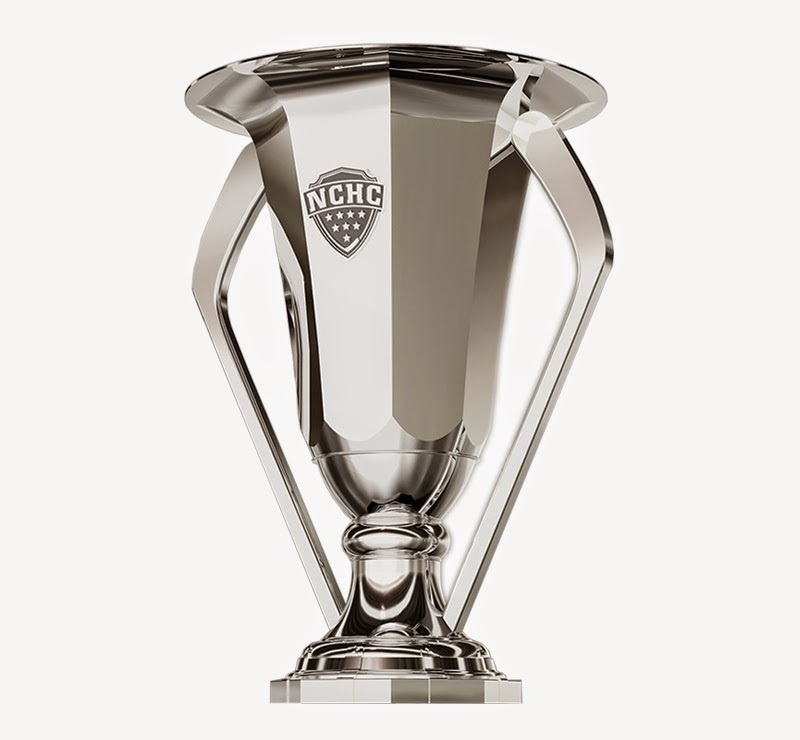 For the nation’s toughest conference, there’s no better way to end a season than to watch four highly-touted teams duke it out for the right to hoist the NCHC tournament trophy. Let’s take a look at who’s left standing and who will take home the tourney title in this weekend’s “Who? What? How?” Frozen Faceoff preview. Standout Stats: 3.38 goals per game (8th in NCAA), 2.14 goals against per game (7th in NCAA), 19-1-3 when scoring first, 23-0-2 when leading after two periods. How they got to Minneapolis: Swept Colorado College, 5-1, 3-2 in Grand Forks. About UND: For the Green and White, the 2014-15 campaign really boils down to two things: Depth and Zane McIntyre. Scoring has come from every line for UND as they bring eight players with at least 20 points and 16 with at least 10 into the Frozen Faceoff. From the fourth line to the top line, North Dakota has found different players chipping in on a nightly basis. Leading the charge of late, senior assistant captain Connor Gaarder’s 5 goals in 6 games, with four game winners in that span, is a heckuva testament to this team’s depth. And in the pipes, consistency in the form of McIntyre has reigned. The newly-donned NCHC goaltender of the year and Hobey Baker finalist has been this team’s unquestioned MVP. UND will continue to be hard to beat if these two pieces continue their stellar play. Standout Stats: +25 in the second period, +280 in shots on goal. About the RedHawks: Much like UND, Miami has relied heavily on its depth and goaltending this year. The RedHawks bring seven 20-point scorers to Minneapolis and feature a high-flying, energy attack. Jay Williams looks like the main difference from last season’s last place NCHC finish. The junior netminder has played well all season and that consistency has allowed Miami to often play with a lead with a dangerous offensive attack. Standout Stats: 3.25 goals per game (10th in NCAA), 15-3-0 when scoring first, 18-0-0 when leading after two periods. About the Pioneers: Denver has been here before, albeit under slightly different circumstances. The defending Frozen Faceoff champions took home the inaugural tournament title last season to pace an improbably run to the NCAA tournament. But, no mistaking, this year’s squad is much different, featuring league MVP and Hobey Baker finalist Joey LaLeggia and unanimous NCHC rookie of the year Danton Heinen. Freshman goaltender Tanner Jalliet has become a mainstay in net for DU and continues a long line of outstanding netminders for Denver. The Pioneers special teams have certainly been special this season as their power play is clipping at a solid 21.6%. While the Pios are all but a lock for the NCAA tournament, repeating as Frozen Faceoff champions is surely high on their to-do list. Standout stats: 24.1% power play (4th in NCAA), -1 in third period, 0-12-0 when trailing after two periods. About the Huskies: St. Cloud State might be the team with the most to play for this weekend, as their NCAA tournament picture isn’t as clear as the other three teams in Minneapolis. Sitting at No. 11 in the Pairwise rankings, the Huskies look well on their way to a tourney berth, but it isn’t yet etched in stone. A win against PWR No. 1 UND on Friday would assure a bid into the big tourney. However, two losses will eliminate them from the NCAA tournament as a below .500 record cannot get them in as an at-large per NCAA rules. While their record doesn’t leap off the page, the Huskies are certainly capable of doing major damage this weekend. Junior forward Jonny Brodzinski paces a Husky attack that loves to play with the extra man. Coming into the Frozen Faceoff, the Huskies are clipping at a phenomenal 24.1% on the power play. Who will hoist the Frozen Faceoff trophy? The Huskies look to be the team with more to play for in the early semifinal, but UND’s focus this season in big-time games has been second to none. The Green and White swept SCSU in Grand Forks in late February pacing UND’s run to the Penrose Cup as NCHC regular season champion. This should be a heck of a game on Friday featuring two teams who know each other very well. As it did in the season series, DDC expects UND’s defense to play a huge role. Keeping Jonny Brodzinksi at bay has been objective No. 1 for North Dakota against the Huskies. While SCSU may be the more desperate team in this one, the Target Center is sure to feature a highly-partisan UND flavor and that should help lift the Green and White. These are two teams that love to push the tempo and fly all over the ice. Both are playing for momentum going into the NCAA tournament, but DDC gives the slight edge to Miami. DDC has seen Miami a lot this season and has really been impressed by their goalie play. Couple that with a dynamic offense that comes at teams in waves, expect to see the RedHawks find a way to outscore the Pioneers. This will truly be desperation time for the Huskies. If SCSU falls to the third place game, it will be win or hit the golf course for the Summer. Nothing against the Pioneers, whatsoever, but St. Cloud gets a big win and punches their ticket to the big dance. 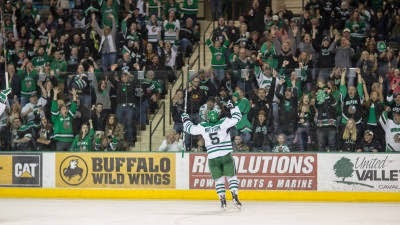 UND has just simply found a way to win games in big spots this season. Whether it be huge late rallies early in the season against Air Force and Lake Superior State, a gritty, hard-fought OT win in Omaha the night after dropping a heart-breaker in OT, a Penrose Cup clinching performance on the back of their netminder in Oxford, or a clutch, game-winning goal from a third-line senior, the Green and White just keep getting it done and getting it done in any way possible. This focus on the brightest of stages is what sets UND apart from the pack. urnament series from Ralph Engelstad Arena. And after a 5-1 and 3-2 series sweep of Colorado College, for the 13th season in a row, UND fans will have the opportunity to follow the Green and White to the Twin Cities while they vie for a conference tournament championship. No. 1 ranked UND shook off a slow start on Friday and netted two goals late in the second period before coasting in the third period. On Saturday, CC brought their A game as a team that was playing for their season and stood toe-to-toe with North Dakota, tying the game in the third period. But, the legend of Connor Gaarder would not let this series go past Saturday. The senior assistant captain added to his growing list of big-time, late-season goals, notching the game-winner on a terrific back-handed, net-crashing one-timer with just over a minute left in the game. After a nice play from Bryn Chyzyk in the neutral zone to turn over the puck, Austin Poganski came in from the right wing with Gaarder barreling towards the net. The freshman made a nifty saucer pass to the slot and Gaarder did the rest, sending the REA faithful into a frenzy and UND to the Target Center. Gaarder’s goal was his fifth in his last six games – and fourth game-winner in that span. The Edina, Minn., native’s penchant for scoring big goals started last season in the Frozen Faceoff as he potted two in a pivotal, third-place game victory over WMU, including the game winner that kept UND’s season alive. Then, in the NCAA tournament, Gaarder sent the Green and White to the Frozen Four with a dramatic double-overtime winner. In Frozen Four, Gaarder did it again, scoring UND’s lone goal against Minnesota, less than a minute after the Gophers took the lead in the third period. The senior leader doesn’t have much to say about this knack for big goals, however. Whatever it is, DDC hopes to see the tough-minded senior continue his flare for the dramatic. Here’s what stood out to DDC in this week’s Roses and Thorns. Gaarder came to UND four years ago as a late addition to the roster following J.T. Miller’s decision to de-commit from the program and bolt for the Canadian Juniors. While this move crushed DDC at the time as Miller was set to be UND’s first New York Rangers draft pick to don the Green and White, there are certainly no reasons to be upset now. While Miller has seen success in Broadway, much to DDC’s liking, Gaarder has become a living legend for UND. Fair trade. After bouncing in and out of the lineup during the first half of the season, the senior defenseman took Christmas break to reevaluate his play. Since then, Mattson has been arguably UND’s best defenseman and he showed up big time against CC. Mattson netted the game-winning goal on Friday and added two assists in the 5-1 added an assist. Mattson has been a force for UND, leading the team with 14 points (3 goals, 11 assists) in the last 14 games. The senior had often been a source of frustration for fans for parts of his career, but he’s brought his game to a new level during a special run. These three were grouped together on the fourth line this weekend and found immediate chemistry. With senior Mark MacMillan officially out for the season and forward Colten St. Clair out for the weekend with injury, Simonson and Olson stepped into the lineup in the playoffs and made a heck of an impact. While trio only notched one point on the weekend, Chyzyk’s second assist on Gaarder’s game-winner on Saturday, the line played with energy and created many chances. Simonson may have had his best game with UND on Friday night, tallying three shots on goal. DDC expects this line to be together this weekend in Minneapolis and is certainly all for it. DDC did not have the opportunity to see UND parade the Penrose Cup around the REA following Saturday night’s win and he’s not happy about it. Ok, DDC gets it, there are timing constraints and other TV programs to be shown, but c’mon, not even a snippet?! C’mon Midco. This was a pinnacle regular-season celebration for the fans of the Green and White and you cut to other programming?! Fail. Well, here’s to hoping for more important trophy celebrations in the coming weeks. Thanks for tuning in once again. Come back later this week for the breakdown of the Frozen Faceoff in Minneapolis.